Learning something new, like a new language, is a good thing for anyone. Making the world better, supporting a cause like saving the elephants, is important for everyone. This book brings together these two good things: - will help you to Learn Spanish and to know elephants better - will help all of us with your and ours contribute to help Save the Elephants ($1 of the book value will be donated to organizations with that purpose). About the book content: Hola | Hello Do you understand this first word in Spanish? Yes, you do! This is Easy Spanish! How? Because you read it using a new technique: bilingual reading (parallel text). How it works? It's simple: bilingual reading works by reading two versions of the same book or text at the same time. One version is in the language you want to learn (in this case, we'll help you learn Spanish) and the other version is in your native language or in another language that you feel comfortable with: here we will use English. This way, you can use short stories to learn Spanish the fun way with the bilingual reading natural method. Using this method, you will quickly begin to discover the meaning of words in Spanish and accumulate vocabulary quickly. This book brings together amazing images of elephants with short informations about this amazing animal written in your native language and in language you want to learn. Little by little in this spanish book for kids or adults you will see that everyone is memorizing more vocabulary in an easy, fast and fun way. It's a great spanish vocabulary language learning resource. 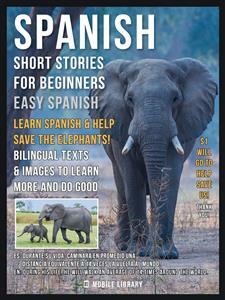 Let's start Learning Spanish and Help Save the Elephants? ($1 of the book value will be donated to organizations with that purpose).